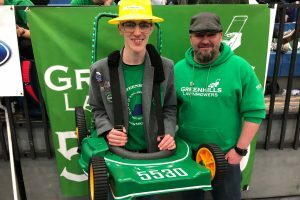 The Greenhills Lawnmowers earned an outstanding win at the FIRST Robotics Competition’s 2019 Lincoln District Event, March 22-23! 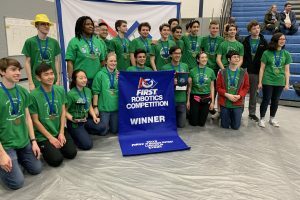 Team 5530 was also awarded the Team Spirit Award sponsored by FCA Foundation, and team member Amon Green (’20) received the district nomination for the prestigious Dean’s List Award. Take pride in knowing that Greenhills is now ranked 26th in the State of Michigan out of 542 robotics teams. The Team started the Lincoln district event relaxed and energized with the start of spring break. Team 5530 opened by playing in the first match, and spirits were bolstered as the Lawnmowers, with their alliance partners, earned a Lincoln district high score to win the match. Throughout the remaining 60 matches on our first day, the lawnmowers drove hard ‘mowing the field’ with respectful matches that had the team’s rank oscillating between 4th and 12th place out of 41 teams. During the day it was also clear that the district announcers took a liking to the Greenhills Lawnmower’s team mascot, Larry Jr., and our signature cheer the ‘lawnmower pull’ as both were frequently featured during match announcements. Team 5530 ended the day with a win – but also the need to repair the robot’s intake mechanism that had been completely destroyed by some fierce efforts on the field. The pit crew leapt into action, remaking parts from scratch as the Lawnmowers relied on ‘gracious professionalism’ and ‘cooperation’ using materials and machine tools lent to us by our competitors. Within 45 minutes the experienced Greenhills’ machinists had the problem solved minutes before the pits closed at 9:00 pm. The second day of the event the Lawnmowers ran into some rough patches as we worked the field, and three losses in a row caused us to drop in ranking. The team entered the midday playoff selection process quiet but hopeful that our scouting/strategy team’s efforts at forging alliances and promoting our strengths with other teams would payoff. The team roared like a lawnmower driven by a Ford V8 engine when our alliance captain, Team 5853, read off our number. Team 7660 joined our 8th seeded alliance team, and we all broke for lunch to fuel up for the afternoon matches. It should be noted that the coding and driving team spent most of their lunch break tweaking the autonomous systems on the robot to enhance our already successful hatch placement system. The playoffs had some exciting wins for Greenhills- starting with an incredible upset in the quarterfinals where the Lawnmowers and their alliance partners staged two wins in a row to beat the first seed alliance that contained the first and third place ranked teams including a team that has won multiple world championships. In the semi-finals the Lawnmowers well designed climbing subsystem and a drive team with nerves of steel allowed the team to pull out two last second wins over our competitors. We entered the finals and it appeared that the excellent on field coaching, strategizing, and leadership skills of Team 5530’s drive team allowed us to win the event. Team 5530 and our partners effectively maneuvered about the playing field passing each other in a well orchestrated plan to fill cargo holds, place patches and play defense against our opponents. Larry’s final climb had us winning by just two points! After a noisy awards ceremony where the team receive our metals, our first blue banner and our trophy, lead mentor Alex Monte-Sano had some words of thanks and praise for the team. He noted that this district event nicely illustrates ‘that if you keep giving it will come back to you…’. A nice reminder to us all that Robotics is more than just building robots, it is about building confidently curious, creative and responsible future citizens. Thank you to everyone who helped the team be successful in this event. To our sponsors Ford, NITS Solutions, and Amesite for your financial giving. To our mentors from Ford and our parent community who develop technical skills and help build spirit. To Steve, Bill, Leslie and all of the building staff that support the team with our off hours work. To our school administration and colleagues who makes this possible for students at Greenhills. And to the team parents who graciously provide food and time to create an invisible support network that helps all of the students move forward and be their best. We look forward to seeing everyone who can join us as we move onto the State Championship! Andrew Angold-Stephens, Katie Ballard, Clara Ballard, Lawrence Bitzer, Tina Chao, Max Colis, Graham Dittmar, Shaman Garcia, Emily Gatlin, Amon Green, Kenya Hall, Matthew Karpenko, Robert Keller, Ryan Kersten, Nathan Koh, Jeremy Kovacs, Johannes Kretzler, Ayla Kurdak, Peter Lastoskie, Patrick Quinn, Aryan Seth, Thomas Zeng, and Alan Zhu. Sydney Cha, Alex Cole, Alena Song, William Stephens, Justin Yu, and Jake Zell.